Tonight, the queues were growing before doors open. Everyone was delighted that unlike back in March the weather was not stopping play tonight. There was no Beast from the East only the Beast on the Guitar, Mr Dan Patlansky on the last night of his winter UK Tour. He had only one more festival show to play, Rockstock 2019 before he heads back home to family life in South Africa. The chatter before among the friends that frequently enjoy live music was about, Christmas, music, the power of Dan’s guitar playing and the sadness that The Tunnels, Bristol would not be a venue destination in 2019. First up tonight was a young band that I have heard a lot about Gorilla Riot. They got the night off to a Melodic/ Southern Rocking start. With three guitars up front and rhythm section, this five-piece has the potential to really create some exciting and energetic interplay of riffs and licks as slide and plectrum meld and take the lead from each other. The vocalist has a great voice and they did create a warm atmosphere with a classy set. Which introduced the band to many with tracks from their two EPs including Bad Son, from American Honey. Into the mix, they add Dirt and Half Cut that certainly got the crowd in a foot-stomping mood. For me, seeing them live for the first time they were raw without energy. Dirty without a clear direction. Reflecting this lack of purpose was a laid-back attitude that went beyond being cool. That said the three guitars really work well and create a platform with time that will make Gorilla Riot a band full of texture and tonal intent that really excites. They are definitely heading in the right direction with tonight’s performance. During the short break anticipation was stratospheric we want to hear that special guitar sound that Dan Patlansky always produces. We wanted to hear tracks from Perfection Kills live. The tension was building up in the packed venue, people now know who Dan Patlansky is, everyone was eager in anticipation of the masterclass in Blues-rock guitar playing to follow. Then in an instant, Dan and the band were on stage. A marvellous opening crescendo of sound with a pure tone emotionally charged from his cream Strat under the manipulation of strings under his fingers. Being in the same room as Dan Patlansky playing is a privilege and astounding pleasure! Tonight, Dan was not playing a different guitar and as he was not promoting an album he had the freedom to explore numbers from Dear Silence Thieves and back into his deep catalogue. Yes, we heard tracks from Perfection Kills and so much more tonight. There was a freedom in his playing that left his previous performances standing still he was playing out of his skin and reaching new heights. As the set progressed the textures and tones ebbed and flowed. Dan, ramped it up with a great chanting number from Introvertigo, Heartbeat, featuring the keys from Tom Gatza full of mastery. We heard Never Long Enough from Perfection Kills. Summing up how we felt, however, the length of the show we will be left wanting more. It is a superb song heard live; perfection like this doesn’t kill – it leads to ecstasy. The music flowed the band provided the platform that Dan uses to full effect with the power of the drums and the rhythmic bass creating the perfect foil for his stinging, singing superb guitar work. Add into this the vocals, deeply rich and pure adding another layer of emotional intent as the songs are delivered with passion and drive. We had slow ballads to give us time to breathe again as Hold –On filled The Tunnels with a clarity as the classic was delivered. For me every number was special, every rendition was spellbinding. There is always a highlight a moment that digs a little deeper into your memory bank. Tonight it was a wonderful, Big Things Going Down from Move My Soul released back in 2009. This is long before the UK caught on to the wonderful playing delivered by Dan. The slow blues cooled the venue down replacing the vibe with a deep silence as we were individually and collectively drawn into the music. The blues fuelled lead-break was breathtaking- it really does not get better than this. The performance was draw-dropping and as the last chord faded away as one the audience breathed again and was filled with the power of slow-blues capturing the spirit of SRV. The heat was raised again with Backbite and the energy returned. He totally captivated the crowd who gazed on in silenced awe at this genius of the Strat. 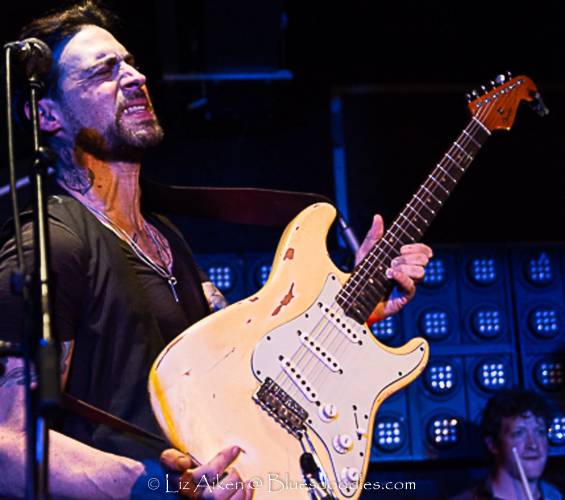 Come back soon Dan Patlansky we love what you do with any Strat in your hands.